​Time remaining to take advantage of this once-in-a-lifetime special offer. All of my groundbreaking courses are completely Online and ready for you to access at anytime from anywhere around the globe. Plus, you’ll be able to “jump on the MIC” every month and you’ll see what this means as you read more. 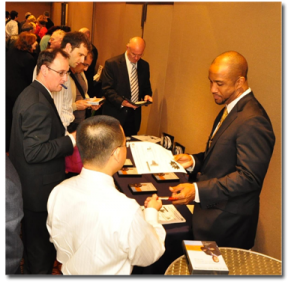 Would you like to become a profitable speaker that others sign up and line up to see? Do you want to make more money in one hour than most speakers make in many months? How would you like to have the confidence and competence to KNOW you can connect with any audience at any time? …you master each piece of public speaking. What do you mean by mastering each piece? Well, if you want to create a masterpiece, you first have to master each piece. There are several pieces to the public speaking puzzle such as storytelling, keynoting, delivery, back of the room sales, humor, owning the stage, structure, content, and more. Unfortunately, many would-be-profitable speakers don’t have access to the tools needed to master each of them and so their careers stay stuck in place. Think about it. Some would-be-world-class speakers can tell great stories but can’t put them into a keynote that others will pay to see. What do you think happens to them as a result? Nothing! Not many organizations will pay you just for a story. Other would-be-profitable speakers deliver fantastic keynote speeches but leave hundreds of thousands of dollars on the table each year by failing to master back of the room sales. What do you think this failure is costing these speakers? I know the answer. A speaking career. If you want to be that profitable speaker at the top of the meeting planners’ lists, you can’t simply master one slice of public speaking. You must master the entire pie. The profit comes from the pie. These slices may not actually be equal in terms of importance, but it’s still important to master each of them to become the profitable speaker others sign up and line up to see. Have you mastered each of them? See for yourself. Let’s take a quick quiz to see how you’re doing as a speaker? (1 being pretty poor and 10 being excellent)? 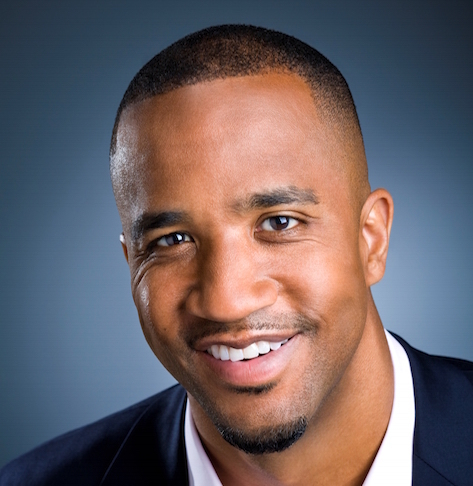 You can give several compelling 30-90 minute keynote speeches or seminars. You make at least an extra $3,000 to $10,000 per speech with back of the room sales and you do it without annoying your audience members. You use spontaneity to spark the speech and make each audience feel special. You influence your audience to actually take action on your message. If I called you today to do a 60-minute keynote speech tomorrow (on your topic area), you would feel confident in being able to hit a home run with that audience the next day? Well, how did you do? Did anything pop out at you that you need to improve? The reason for the quiz is because these are the areas you must master to become the kind of speaker that’s booked often and paid well. Do you feel that you have all of the right tools? When I started as a speaker, it wasn’t easy to find these tools. In fact, it took me more than 16 years of serious endless searching, failing, falling on my face, getting back up, asking, paying, praying, testing, and tweaking before I began to figure out the systems, processes, and formulas that led me to more presentations and much more profits. My journey literally included blood, sweat, and tears as I was simply trying to make it. The tools were so disparate that it felt like I was searching in a thousand different directions and I was still ending up lost. This is where the good news comes in for you. I could never find all of the necessary speaking tools in one place but you can. That’s right! YOU can. And do you know why? Because I’ve created that place… a one-stop-shop for your speaking success. 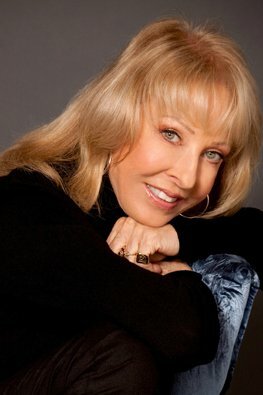 which is designed to help you become a highly-successful, well-paid speaker in great-demand. What does the Speak and Prosper Academy Include? Unlimited-Access to 8 groundbreaking Home-Study Courses for Speakers that will change your future and your fortune in speaking. The courses have more than 70 hours of audio and video instruction plus interactive workbooks that contain models, formulas, step-by-step instructions, dos and don’ts, and tools for building yourself into a top-notch speaker in high-demand. 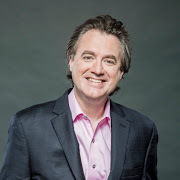 Access to the Craig Valentine Speak and Prosper Academy’s Exclusive Facebook Community where you can quickly increase your speaking abilities and opportunities by interacting with Craig, several Certified World Class Speaking Coaches, and other speakers. Access into this group is optional but certainly suggested. Finally, you can find all of the necessary tools in one place with this all-you-can-eat academy of proven programs. It’s your one-stop-shop for speaking success. 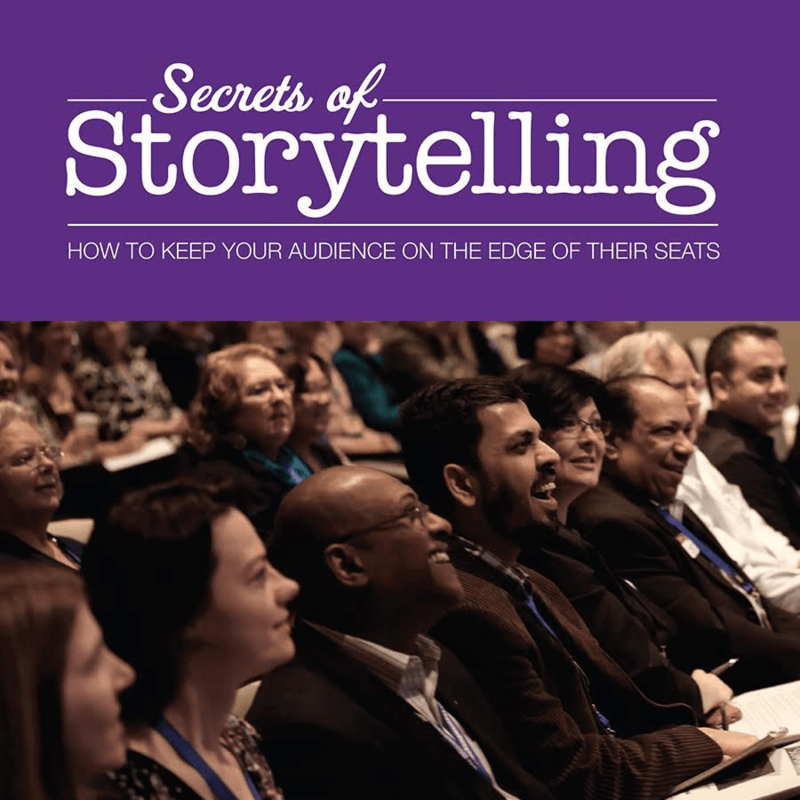 Learn the ins and outs and dos and don’ts of storytelling, keynoting, delivery, humor, income generation, owning the stage, back of the room sales, and much more all in one place! 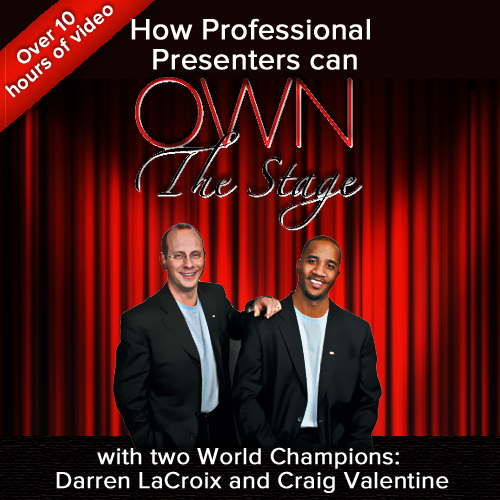 See how to build your speeches, your confidence, and your income all at the same time. 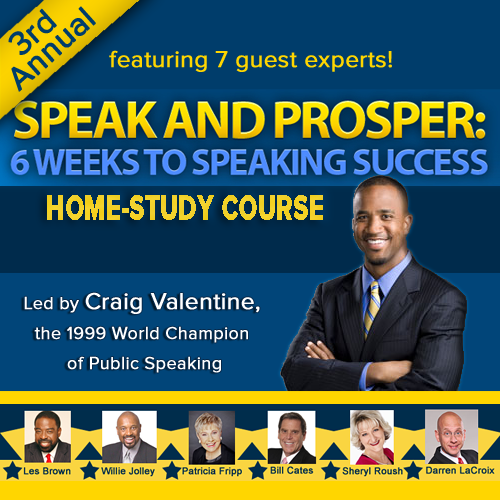 Let’s take a look at what you’ll be able to do after registering for Craig Valentine's Speak and Prosper Academy. Quickly separate yourself from average speakers by integrating a 49-point checklist (in a Guide to Greatness workbook) on how to not just take the stage but to own it! Grasp how to turn a 5-7 minute speech into a 30, 45, 60, or 90 minute program that’s worth thousands (and do it without the stress and frustration most speakers feel)! When I wrote my first book, "The Nuts and Bolts of Public Speaking", I made one mistake that prevented me from making much money. With this one misstep, I left hundreds of thousands of dollars on the table. However, by the time I wrote my second book, "World Class Speaking", I had made the one correction that, to date, has brought in an extra $695,909.00. Simply by understanding what needed to be done (i.e. using the right tools) I met with success and, the best part is, that’s only one stream of income. Mistakes like the one I made are being made in every area of public speaking so imagine what your speaking career could be like with constant breakthroughs like the one I had. I can tell you what your career would feel like. Like a masterpiece! I learned more from you in one hour than I have in years of giving speeches. 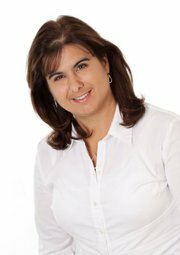 Author, Speaker, Business Coach, DreamBanc, L.L.C. When you follow the step by step processes of the models and formulas you will pick up in this Academy, you will internalize the content and automatically become the kind of speaker who can keep your audience on the edge of their seats. As a result, you can become the go-to speaker on your topic for organizations around the world. What are the Exact Courses You Get Online Access to Immediately? 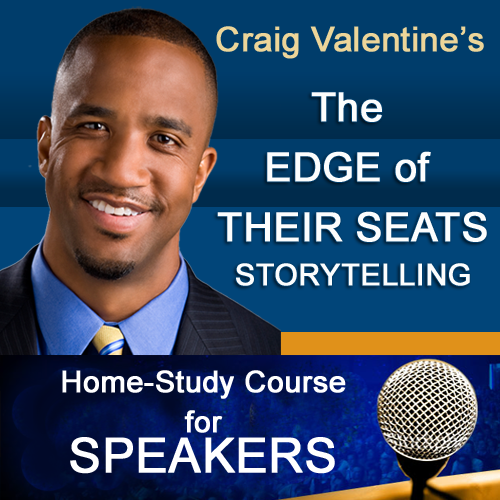 I now deliver better presentations in 20 minutes than I did in 60 minutes; moreover, my closing ratio has increased 350% thanks to the lessons learned in The Edge of Their Seats Storytelling Home-Study Course. 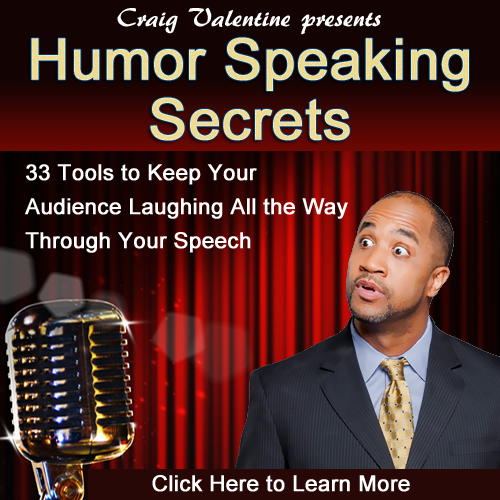 Craig’s 9 Step Formula has changed my life and it will change yours..."
"Craig Valentine is like the Jazz Master of Public Speaking. A lot of speakers know how to work magic. A few know how to explain it. But no one can share it as well as Craig Valentine. I’m sure I’ll be a student of Craig Valentine for life." "Your speaking style blew up my mind the first time I saw you at the… conference. I never laughed as much at a presentation. You showed me new horizons. Thank you for… sharing your secrets with other speakers." "I understand at a much deeper level why I laughed 100 times in 45 minutes, without you telling jokes. Thank you so much for your gifts." 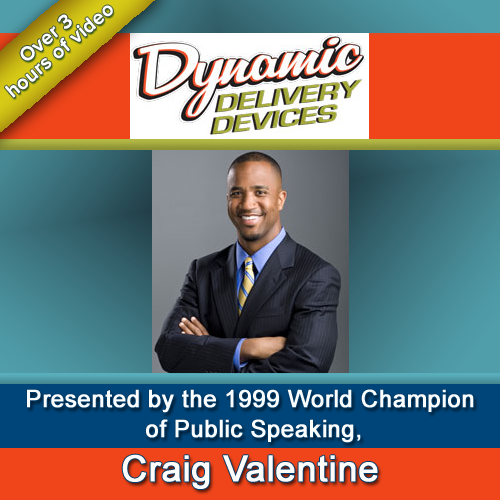 "As veteran in the speaking industry I must say Craig Valentine’s system for selling is without a doubt the Best Ever produced for my profession…” Les Brown CPAE (National Speaker’s Association Hall of Fame), Toastmaster’s Golden Gavel award Recipient"
"Thanks to the…Dynamic Delivery Devices…several of the attendees commented on my stories and "lessons". Folks came up to me during the next 2 days and explained how they could relate to them. And 86% of the people rated the presentation as Excellent!!! Thanks Craig - I could not have done it without you." 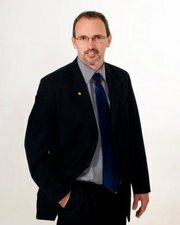 Tom Schweizer Mentor - Certified Coach - Speaker Not-For-Profit Success! "It’s hard to impress me - but this was beyond phenomenal. It’s one decade of learning compressed into two days ...with mind-blowing results.."
"I traveled 17 hours to go to this Boot Camp, and it was worth every hour. The investment was returned triple fold. The knowledge you get from this camp, you can’t put a price on it." "You inspired me, educated me, and cared about my dreams. I am 20,000 times better than I would have been without Craig and Darren." "Hi Craig. Surpassed my expectations yet again! Thank you so much. Loved all of the content! Excellent! I had to crack up though, when you mentioned the "teases" on the sports show. I'm a former TV news anchor...and that's exactly what we do. Thank you for such an outstanding job!" As you can see from the prices, if you were to purchase each of these programs separately, you’d pay $3,074.00. Fortunately, as you will see below, there is a much more exciting opportunity available to you. In addition to the all-you-can-eat buffet of top-notch home-study courses you will instantly access, you’ll also be able to turbo-boost your speeches and your career by having FREE ADMISSION to jump on my MICs (Monthly Implementation Calls). These calls will show you exactly how to keep your audience hooked and keep you booked to speak time and time again. On these calls we will go DEEP into advanced tools you will not find anywhere else. 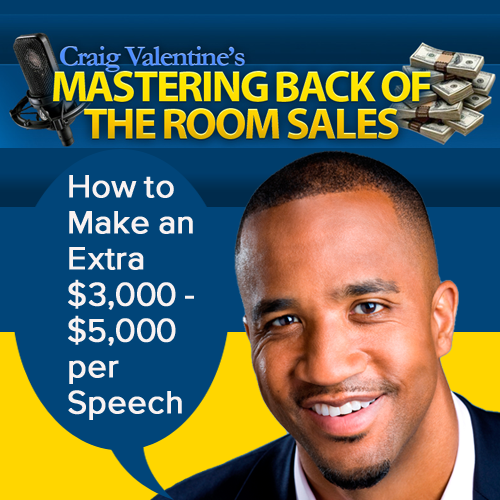 To make this offer even better, you'll gain immediate access to 51 of Craig’s greatest audio lessons (10-15 minutes each) on mastering all aspects of the art of public speaking. Note: These are NOT the same lessons from Craig’s 52 Speaking Tips site or Craig's 50 Speaking Secrets site. Think about it. If you spread each of these audio lessons out once per week, you’d have nearly an entire year worth of lessons for FREE. I think you'll agree that these 51 FREE bonuses will greatly enhance your speaking success. They're all yours for free when you register for the Craig Valentine Speak and Prosper Academy. You get them the moment you register. They’re Online in the Academy. You can access them instantly at your home or office or anywhere via the Internet! You can even download the audios and workbooks to access them offline. You can’t download the videos but you can certainly view them online and the great news is they are always with you as long as you have internet access! There’s no travel! You simply access the 8 home-study courses and MICs (Monthly Implementation Calls) from wherever you happen to be (home, office, bed) at any given time. 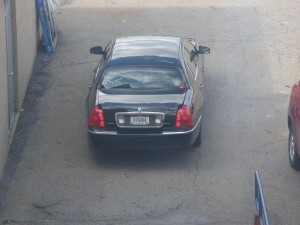 No airports, no hassle, no travel, no rental cars, no hotel rooms, and no additional expenses. Just log on and lift off! How can you get started and how does it work? Simply scroll down to register. Once you register, you will be taken directly into the Academy where you can access all of the courses. You’ll also immediately receive an e-mail (it may take a little longer if you use PayPal) with your login information you can use for future ongoing access. When I hold live in-person events, one of the pieces of feedback I usually receive is that the participants really value meeting the other participants. Well, why stop this now? 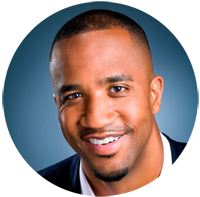 You will have access to an exclusive Facebook Community made up of other speakers who have registered for the Craig Valentine Speak and Prosper Academy. This is a place to exchange ideas, reinforce what you learn in the courses, and possibly even join forces with others on your path. It is also filled with Certified World Class Speaking Coaches in case you want to get world-class advice from coaches who can help you soar as a speaker. Speakers don’t make it alone. If I didn’t have my business partners, I wouldn’t have survived this industry. Partnerships = profits. 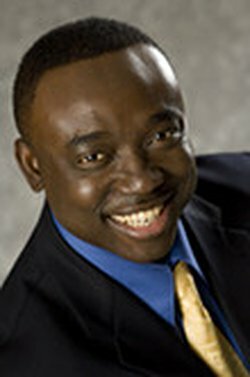 Oh, and I am in the Community as well so I look forward to connecting with you! If you're like me, you might be thinking, “But Craig, there are so many programs out there promising to teach the art of speaking. Why should I attend yours over someone else’s? 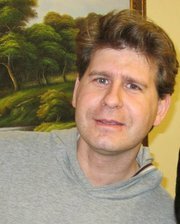 Why Learn from Me (Craig Valentine)? There are at least 6 major reasons why you’ll want to learn from me. Reason One: Unlike many of the current public speaking coaches, I am actually a busy speaker. That’s right. I’m out on the circuit speaking and getting paid handsomely. In other words, I’m walking my talk and I know what doesn’t work TODAY that maybe did work yesterday. 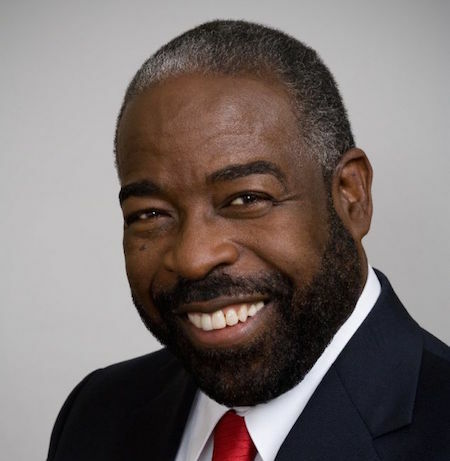 Reason Two: I have some of the most successful professional speakers of all time as guest experts including Les Brown, Willie Jolley, Patricia Fripp, Bill Cates, Darren LaCroix, Mitch Meyerson, Ed Tate, Sheryl Roush, Tina Cook, Michael Hauge, and more! Reason Three: You should know one very important thing about me. I am not a natural. It’s second-nature now, but I’m not a natural. Why is that important to you? If you think you are a natural speaker then, even with all the greatest tools in the world, you won’t be able to connect deeply with your audience. Why? Because in speaking you don’t want to be special to your audience. You want to be similar to them. In these courses you’ll find out why and how. I’m simply a person who, through blood, sweat, tears, and lots of failures, has uncovered the tools that continue to work for me and for the hundreds of speakers I have coached personally and the thousands who have invested in my programs. Reason Four: Here’s something you’ll get from me that you won’t find in most courses. Because I’m actually out there speaking all the time, you’ll hear and see live examples from my speeches that illustrate the lessons you pick up. This helps you go beyond theory to see EXACTLY how you can apply the tools you gain in the course. This is one of the main reasons why I have thousands of customers in dozens of countries. Plus, you’ll be able to JUMP ON THE MIC (Monthly Implementation Calls) with me to put the tools from the courses to work in your speeches. Reason Five: There is no fluff in the courses. Have you ever accessed a course and it seemed to take forever to get to something valuable and practical? Well, you don’t have to worry about that here. In fact, you’ll get the nuts and bolts. You’ll receive workbooks and action guides that I’m sure you’ll fill with notes and actions you can take to become the best speaker in your neck of the woods. Reason Six: You’ll become a complete speaker. You see, many would-be speakers are good at one thing but poor at others. For example, some are good storytellers. But that’s not enough. Some are good at stories and content and delivery but even that’s not enough. For example, most speakers are missing a huge key ingredient to really making it big as a speaker. They don’t know how to sell from the back of the room. It’s hard for me to watch some speakers because I know that, as good as they are, they won’t be in business for long. Why? Because they haven’t mastered BORS (Back of the Room Sales). The funny little secret is that mastering back of the room sales gets you more opportunities to be in the front of the room. That’s right. 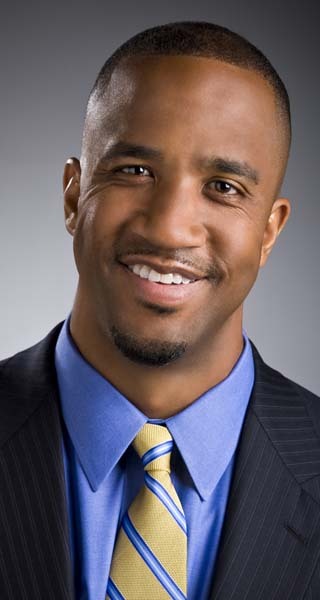 Your products promote your speaking engagements. Then your speaking engagements promote your products. 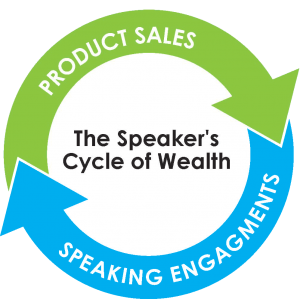 Once you land on this wonderful Speaker’s Cycle of Wealth, you see opportunities and money coming at you from every angle. Name one successful hugely speaker that doesn’t have a product or know how to sell it. You also have those speakers who actually DO know how to sell from the back of the room but there’s one big problem. They annoy their audiences. They too won’t be in business for long, because they won’t get that all-important repeat business. After all, what good is selling from the back of the room when you’re ticking off the rest of the room? What you might not know about me is that I used to be an Events Manager and part of my job was to set up the stage for speakers at technology expos around the USA. Think about that! I was setting up the stage for the speakers when, all the while, I wished to BE the speaker. It was excruciating. At every event I would move the chairs in the audience and set up the lectern and tape down the power cords. However, there was something that I did EVERY SINGLE TIME that I truly believe started me on this path of being a successful speaker. The only problem I had was figuring out how I could turn tomorrow into today. Years later, one question made all of the difference for my career. When I answered that question for myself, I immediately invested $4,000 for a day of speech coaching and that was the turning point for my entire career. I can still remember THE day when I finished a speaking engagement, shook hands with dozens and dozens of influential CEOs that were in my audience, and then hopped into the limo that took me back to the airport. As we rode I started thinking, “Wow! This is a long way from those days standing behind the lecterns telling myself that one day I’d move the audience.” That day I was SURE they were moved. The answer is simple. Tools! Although it took years, I uncovered the tools that helped me build the speeches that continue to build my career. Instead of a decade of trial and error, you can get these same tools instantly. Okay, how much does this entire Academy cost? As you can see in the list of courses above, if you decided to purchase each of them separately, you’d pay a whopping $3,074 and they would still be well worth it. Heck, by the time you go through these courses, you should be able to make much more money than that with one keynote speech! Plus, remember that my turning point came from investing $4,000 for a day of coaching. If you hired me to coach you on just one of these programs, you’d pay at least a minimum of a few thousand dollars for a half-day session. However, once you register for the Craig Valentine Speak and Prosper Academy, you’ll be able to access ALL of these 8 courses (and the LIVE MICs) that can rapidly enrich your speaking career for a one-time investment of $﻿﻿797﻿﻿. Unbelievable, right? at midnight Eastern (New York Time Zone)! Single Payment: Get immediate lifetime access to the Speak and Prosper Academy for $797. Two-Payments (split into 2 monthly installments): Get immediate lifetime access to the Speak and Prosper Academy for 2 monthly payments of $398.50. Note: PayPal is only accepted for the single payment option. If you use PayPal, you may not receive your initial access for 24 hours. What about a Guarantee? Doesn’t every offer have a Guarantee? 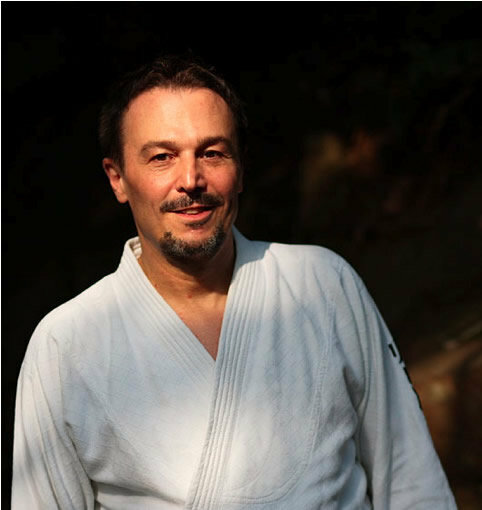 I’ve received thousands of unsolicited and heartfelt testimonials over the years and I’ve also witnessed my students thriving around the world. In other words, the tools are PROVEN to work. The only reason they won't work is if you don't use them. Make up your mind to master this craft. Because much of this content is online and downloadable, there will be no refunds given. However, if you are truly committed to this craft, then you will see the immense value in these tools. Simply invest once and inspire forever! Can I purchase just a single course instead of the entire Academy? Absolutely. 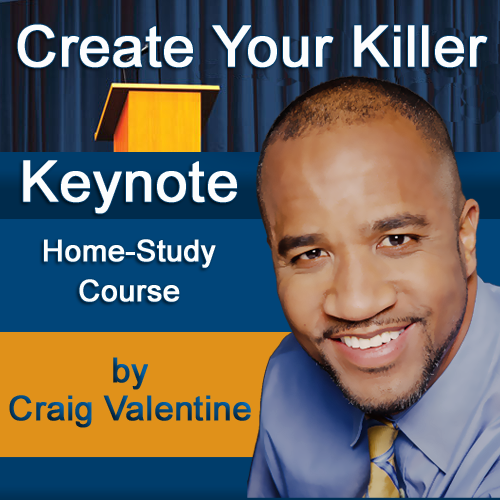 You can visit CraigValen﻿﻿tine.com to purchase any individual course. However, keep in mind you’d be purchasing one course for $147 - $997 in price when you can get all-access to all 8 courses plus the upcoming MICs (Monthly Implementation Calls) and admission to the private community for only $797. But what if I already purchased a program (or two) that is now listed in the Academy? That’s a great question and I’ve given much thought to it for several weeks. Here’s what I will tell you. First of all, thank you. I sincerely hope the program(s) has been valuable to you. If you want to round out your speaking tools with the other programs that you haven't purchased, you can either purchase each one of them separately at $147 - $997 per program or register for the Academy and get ALL OF THEM for $797. Plus, you and I will be able to connect through the Private Community and on the LIVE MICs (Monthly Implementation Calls). Being able to make these tools work for you is the critical part. When I reflect back on what I have been through (including the frustrating years and the investment of thousands upon thousands of dollars) to uncover these valuable tools, I feel that this is about as good as a deal can get. Whether you have a couple of my programs or not, this is a deal that can't be beat. Remember, to create a masterpiece, you first must master each piece. I’ve literally created an Academy that I would have invested tens of thousands of dollars in to save myself from years of frustration. You can have it all instantly! Can I download the programs? Yes, you can download the audio home-study courses including the audios and the interactive workbooks or you can simply listen to them online. For the video home-study courses, you can download the interactive workbooks but not the videos. You can simply watch the videos online. Are you ready to spread your message around the globe and get highly compensated for it? Ready to Speak and Prosper? It’s easy to get started. Simply click here and get the tools to become the top-notch, well-known speaker you know you deserve to be. P.S. In case you're wondering, mastering the art of public speaking is undeniably inseparable from mastering the business of it. They go hand and hand. 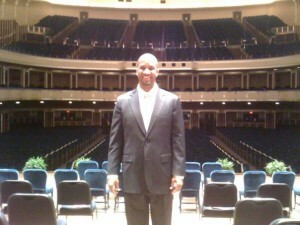 What you do on stage will determine how much income you have when you get off stage. 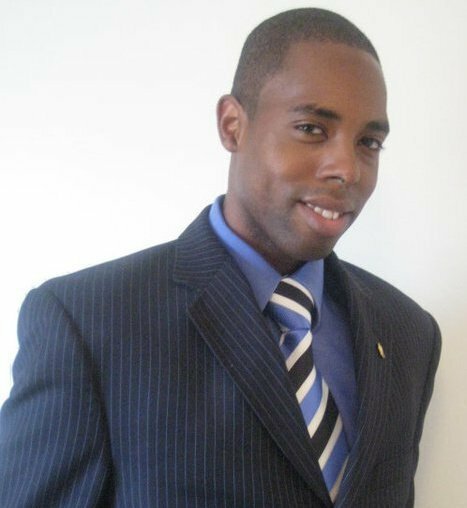 If you want to make money as a speaker, then The Craig Valentine Speak and Prosper Academy is a perfect next step for you. Still have questions? Email us at ﻿﻿﻿﻿﻿speak@craigvalentine.com and we will get back to you quickly. Get instant access now.